The Cyber-shot HX99 replaces the three-year-old HX90V as Sony's new high-end travel-zoom compact camera. Like the HX90V, it sports the same 30x optical zoom lens with Zeiss Vario-Sonnar T-star branding, 18 megapixel image sensor, high resolution pop-up electronic viewfinder, lens barrel control ring, wi-fi and NFC connectivity and a 180-degree flip-up screen. New features for 2018 include 4K video recording at 25p and 1080p at 100fps slow-motion, Eye AF, touch focus/touch shutter function, RAW format image recording, location data acquisition via Bluetooth, 10fps continuous shooting for up to 155 frames, and an expanded ISO range of 80-6400. The launch price of the Sony HX99 has increased significantly compared to the the HX90V, especially in the UK - whereas that model had an asking price of £339/$428, the HX99 now costs £450/$450. From the outside, the HX99 looks and feels almost identical to the HX90V model that it replaces, so a lot of the comments that we made about that camera apply equally to this new model. 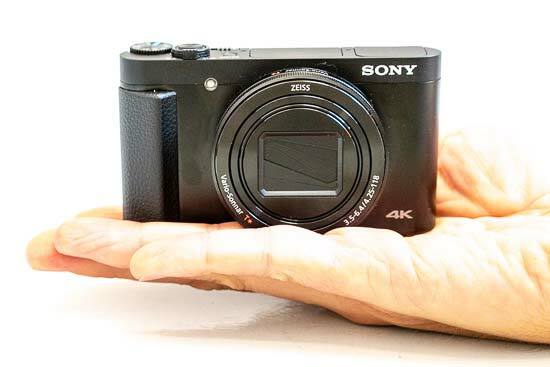 At 102.0mm x 58.1mm x 35.5mm, the Sony HX99 is still the World's smallest camera on sale to feature a 30x optical zoom. 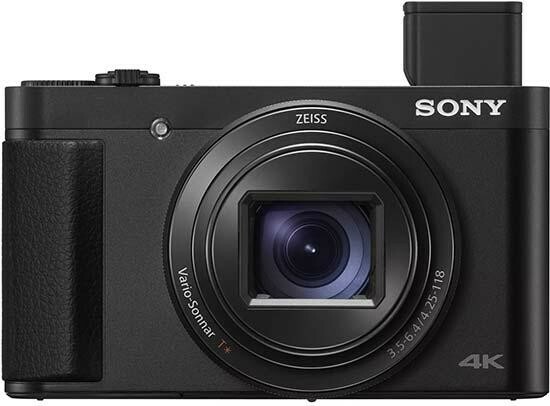 It's noticeably smaller than the 30x compact camera competition from Canon, Nikon and Panasonic, and yet, despite this, it's definitely not short on features. The 30x zoom lens is certainly impressive, giving a 24-720mm-equivalent focal range, which along with its small stature makes the HX99 very versatile indeed. The HX99 once again has a pop-up electronic viewfinder. 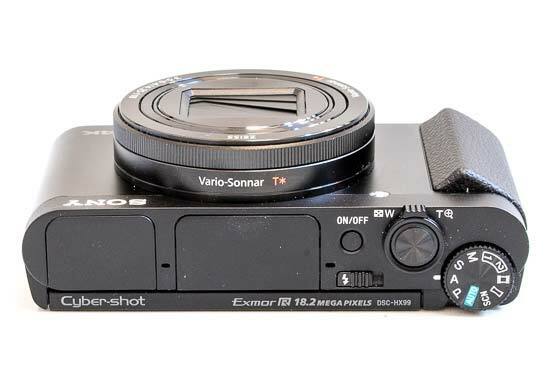 Keen followers of the Cyber-shot range will recognise this from the premium RX100 series, and it ejects in the same way. Flick the release switch by your left hand and up it pops, powering the HX99 on in the process. You'll also need to pull the eyepiece towards your eye though, as otherwise the EVF won't activate when you go to use it, something that the most recent RX100 camera has fixed. Once it bursts into life, the 1,440k-dot resolution is crisp and colour reproduction faithful. Also squeezed into the HX99's top panel is a pop-up flash, however including this, the EVF and the smaller case design means you don't get a hotshoe mount for attaching a flashgun or other accessory. The older HX60V's useful exposure compensation dial has also been deleted from the HX99, and instead you'll have to nudge the rear panel D-pad down and use the surrounding control ring to adjust exposure. It's no particular hardship, but a dedicated dial would be even easier. 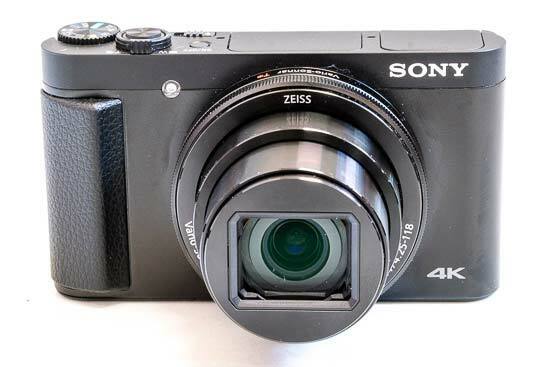 The miniaturized design also has a knock-on effect of compressing the rear panel buttons together to a point that they're far fiddlier to use than on a larger Canon SX or Panasonic TZ model. The lack of button space also means that the rear thumb rest is pretty tiny and not particularly grippy, although there is a good-sized – if plasticky – front hand-grip. The control ring around the lens has been retained on the HX99. The ring can be used to operate the zoom, but it can also be customised to control exposure compensation, white balance, ISO sensitivity, shutter speed and aperture. By default, it'll control zoom when the camera is in either of its automatic modes, adjust aperture in program auto, aperture priority and manual mode (with the rear control wheel altering shutter speed), and the lens ring sets shutter speed in shutter priority mode. If you activate manual focussing, the ring is then used to focus, and by pressing the Fn button on the rear panel, the ring will operate the last-used menu option. 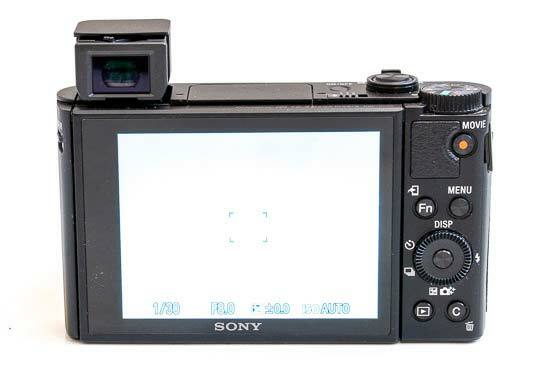 The Sony Cyber-shot HX99's LCD screen has been further improved. It's still a 3-inch, 922k-dot panel that can flip up through 180 degrees, making low-level shots easier to compose and selfie-snapping a doddle, but it's also now touch-sensitive. Well, kind of, in that you can activate touch focus and touch shutter functions, which work even when using the pop-up viewfinder - you can hold the camera up to eye-level and use your right thumb on the LCD screen to drag/posititon the AF point. But that's it - you can't select menu options, or scroll through your image during playback, or any of the other things that you might reasonably expect to be able to do on a touch-enabled device in 2018. The Fn button on the rear accesses a quick-reference menu of commonly required shooting settings. These include typical options like ISO sensitivity, white balance and flash modes, but also some features more often associated with DSLRs and high-end bridge cameras. You can chose between matrix, centre-weighted and spot metering options, or also dial in some flash exposure compensation. Focus area is adjustable, too, as is the amount of DRO (Dynamic Range Optimizer) that's applied to high-contrast shots. Even the drive modes include some settings not usually found on a compact camera. In addition to the self-timer (2, 5 and 10 second delay options) and continuous shooting (10fps max for up to 155 frames, a big improvement on the HX90V's 10-frame buffer), there are also extensive bracketing options. You can choose from manual and continuous three-frame exposure bracketing with multiple exposure variation options, plus white balance and DRO bracketing. The Sony HX99 now offers 4K video recording at 25p/100M or 25p/60M in the XAVC S format. If you're into slow-motion, there's a 100p/100M and 100p/60M options in the 1080 XAVC S HD format. Note that you'll need to use a UHS-I/II U3 compatible Micro SD card to access either of these recording modes, and also note that 4K recording time is limited to 5 minutes, at which point you'll need to start a new clip. When in playback mode, the Fn button can be used to activate the Sony Cyber-shot HX99's Wi-Fi connectivity to send a single image or multiple shots to a smartphone or tablet. NFC pairing makes establishing a connection as simple as just tapping your smart device against the camera, and once connected, a full resolution image will take roughly eight seconds to transfer via Sony's PlayMemories Mobile app, available for Android, iOS and Windows Mobile. The app will also now let you remotely control the HX99 from a smartphone. Unlike the previous HX90V, which included GPS to geolocate your images, the new HX99 instead has Bluetooth connectivity, which can collect and record the location data for a photo/video via a connected mobile device. This saves on battery life, now up to a CIPA rated 460 shots, but is obviously less convenient that having GPS built-in to the camera. You can also use the Bluetooth connection to small-size images to your smartphone for quick sharing. The HX99 features a full range of creative shooting options like manual control, shutter and aperture priority modes. There's also now two Memory Recall modes (simply labelled 1 and 2 on the mode dial) whereby you can store a particular shooting set-up for quick recall. In addition to a full complement of scene modes, the HX99 also gets Sony's iSweep Panorama feature which occupies a dedicated position on the mode dial. Finally, there are two automatic modes: program auto enables the usual adjustment of ISO sensitivity, white balance, metering and focussing options whilst maintaining automatic shutter speed and aperture. Then there's the standard scene-detecting fully automatic mode which is selected by opting for the green Auto mode dial icon. 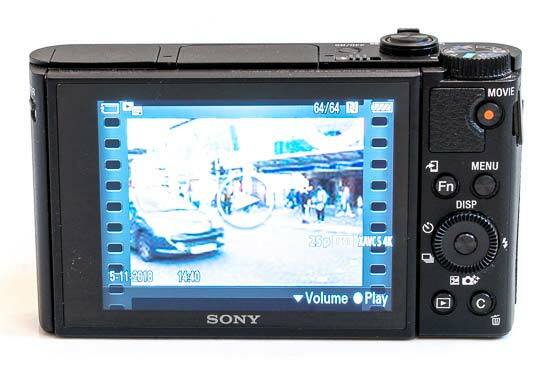 With so many modes and features, the Sony Cyber-shot HX99 can be somewhat intimidating to get to grips with if you're coming from a budget no-frills compact camera, especially if you delve straight into the plethora of options in the main menu. Sony's menu design is clear, with settings laid out in logical tabs and sub-pages, though the positioning of particular options within these isn't always intuitive. Fortunately the Fn button and its quick reference menu mean you can usually steer clear of the main menu, whilst the mode dial can be configured to display a brief splash screen graphic explaining the mode you select. At the bottom of the rear panel, to the right of the playback button, is the new Custom button. By default this opens the ISO menu, but as the name suggests, you can customise it to activate one of the 50 available options. 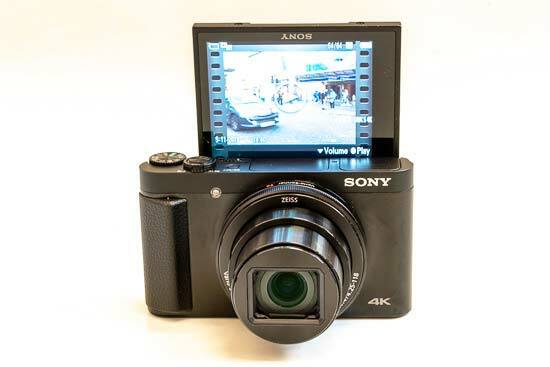 The Sony Cyber-shot HX99 is quicker than the HX90V to power up and snap an image, taking approximately 1.5 seconds. Once up and running, fast autofocussing ensures daylight subjects are locked on to almost instantly, and with the aid of the AF-assist lamp, autofocussing only slows fractionally in low light. New to the HX99 is Eye AF, which works in exactly the same way as on the Alpha mirrorless cameras, although it's not compatible with the AF-C focusing mode, making it less useful. Even worse, AF-C mode is actually only available when shooting video, not stills, which instantly makes the HX99 a non-starter for any kind of fast-moving action photography.